Smartphone and tablet operate on the Android 4.1 Jelly Bean operating system; module is designed to provide Band 14 connectivity to existing devices. Elektrobit (EB) today announced the release of three LTE devices — a tablet, a smartphone and a module — that will operate on Band 14, which is the 700 MHz spectrum that will be utilized in the nationwide broadband network for first responders that is being deployed by FirstNet. All three devices are in the process of undergoing testing by the Public Safety Communications Research (PSCR) program, according to Jani Lyrintzis, EB vice president and general manager. "We participated in the demos arranged by PSCR, and all the devices were shown to the FirstNet board of directors during the last tour after the [most recent] board meeting," Lyrintzis said during an interview with Urgent Communications. EB's new smartphone is called the H3, which includes Wi-Fi and Bluetooth connectivity, Lyrintzis said. The H3 runs the Android 4.1 Jelly Bean operating system, is upgradeable to Key Lime Pie — the next version of the Android operating system — and features a 4.3-inch LCD display, according to an EB press release. 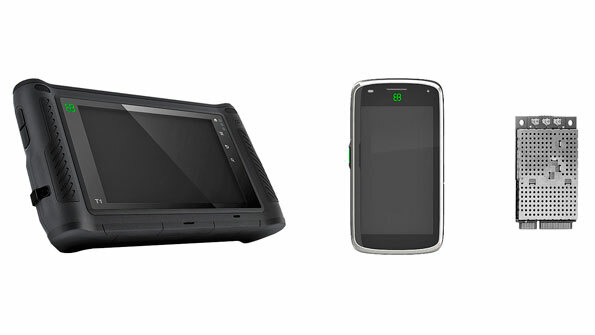 With the same operating-system characteristics, the T1 is a ruggedized tablet with a 7-inch LCD display and a waterproof casing that meets IP67 and MIL-STC-810G requirements, according to the EB press release. It also features long battery life, which can be important in emergency scenarios, Lyrintzis said. "The T1 is a rugged tablet device with a lot of battery capacity — up to 14,000 mAh," he said. "It's targeted to last up to two or three days while in use in a public-safety or defense application." For existing devices that do not have connectivity access to Band 14, Lyrintzis said that EB has developed the M1 module — a multiband LTE modem in a standard mPCI-card form factor that includes support for Windows and Linux environments. Entities wanting to trial any of these products in EB's specialized device platform can do so immediately, Lyrintzis said. However, EB does not sell its products directly to agency or individual end users. "Our business model is somewhat different than a typical OEM model. We are not an OEM provider … so we need somebody to put their brand in the device to go to market," Lyrintzis said. "They could buy directly from us for trials. But, if and when they want to use a device in a real operating network, then they need to buy it from a supplier brand house. "We have some form of a business relationship — or at least an ongoing dialog — with pretty much all of the device providers to FirstNet." befor we think some systems wa ok like tetra but now we looking for LET technology & i think is better than other systems in public safty communication.